There are many places you can visit in Dallas that will knock your socks off. We have restaurants, shopping, beautiful art, and many other things that bring tourists here. My favorite spot without a doubt is the Dallas Arboretum. In every season, there's something spectacular to behold. Right now the Arboretum is decked out for Autumn. 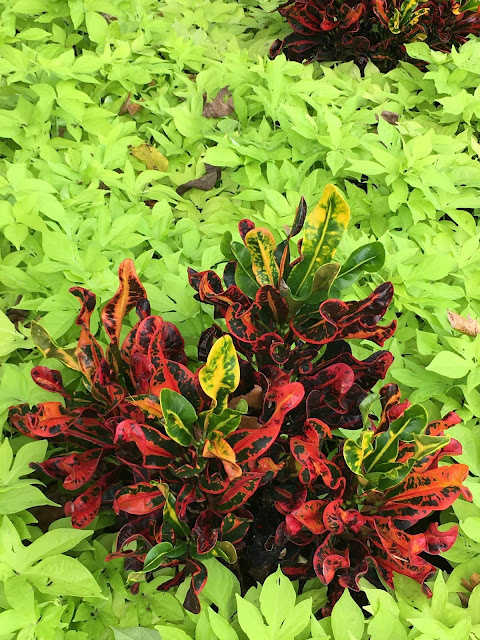 In Dallas, that means summer's flowers and plants are looking great because the weather has cooled off but also there are new plants that have been added to spice up the seasonal displays. Speaking of seasonal...there are thousands of pumpkins! 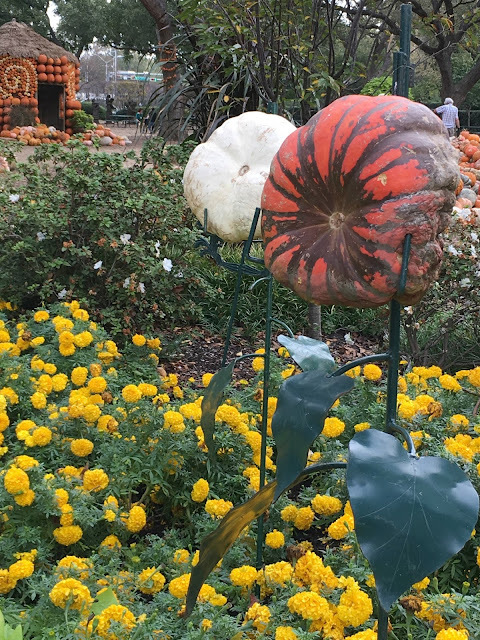 A visit to the Dallas Arboretum is good for your soul! The squirrels are fat and happy. The birds are singing. Everywhere you look, people are smiling because nature is good for you. Even the fish are beautiful in their beautiful ponds! Want to see other beautiful visits to the Arboretum? Click here, here, and here. One of these days I definitely want to visit Butchart Gardens and the gardens of the Biltmore but for now this Texas girl is happy that the Dallas Arboretum is a short drive away. What is your favorite public garden to visit? On another note... The Thoughts of Home on Thursday team would like to thank you all so much for joining us for 40 fabulous weeks. You shared your inspirational posts with us and everyone else...you supported us with your sweet comments and willingness to be a part of something bigger. We've decided to end with 40 special weeks behind us. Thank you so much for all you've done for us and with us. I will continue to post as normal as will Jemma, Laura, and Laura. We hope you will visit each of us individually. What a beautiful place and you are so right- Dallas has so many beautiful areas to visit. Now- I need to know what you are saying to that statue?? What a darling picture of you! 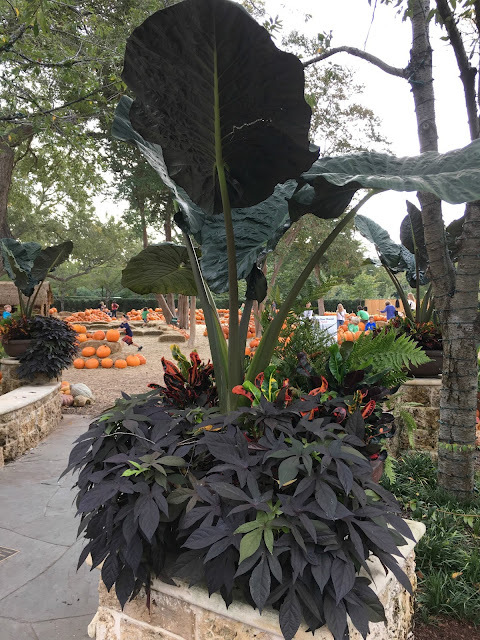 I too adore the Dallas Arboretum. Each season has something wonderful to offer. I love visiting gardens when I travel. I'll have to put this on my list for the next time I'm in Dallas! Would you believe that I have never been there? I keep thinking I will visit every time I see pictures. Maybe I will put this on my list for 2017. It really is a jewel. I visited once about 7 years ago in the Spring. So beautiful. My brother and his family live in Dallas. What a beautiful place to wander! I am going to the Biltmore this Saturday for a hike and picnic with friends. This time of the year the garden at the Biltmore will have mums and more mums plus pansies. I hope to get some pictures to share. Stacey, what a beautiful place. I have never been to Biltmore. You have so many lovely places to visit. Thanks for sharing this wonderful post. Thank you for hosting TOHOT. The party shall be missed, but I do understand. Have a lovely week. I would love to go there with my camera! So funny, the pic of you and Mark Twain. Looks like a wonderful conversation. Gorgeous and I love the pic of you and Mark Twain. How fun is that. You and "Mark T".....so cute!! Mhusband was almost going to Dallas this week for business but they diverted to Vegas, lol. I'm tagging along to go to places like this if he ever gets the chance again. Happy Monday beautiful!! LOVE the photo of you...that is just too cute!! I have yet to make it to the Arboretum, but hope to get there before too long! Love and hugs!! What imaginative photos! I love it. It looks like a wonderful place to visit. A glorious spot to visit and feel peace and beauty. Perhaps when I visit Dallas in January for Rick's mom's birthday we will have a loose enough schedule that I can explore this place -- or maybe even have a face-to-face! I'm sorry about Thoughts of Home but I can't help but imagine it is pretty time consuming and from what I can tell all of you have boatloads on your plates, from moving to school to more involved blogging and more! So of course I'll keep following and visiting and hope you do, too! Stacey, I would have loved to have been a fly on the pumpkin, to be privy to your intriguing conversation with Mr. Twain! I love visiting the Fort Worth Botanical Gardens. 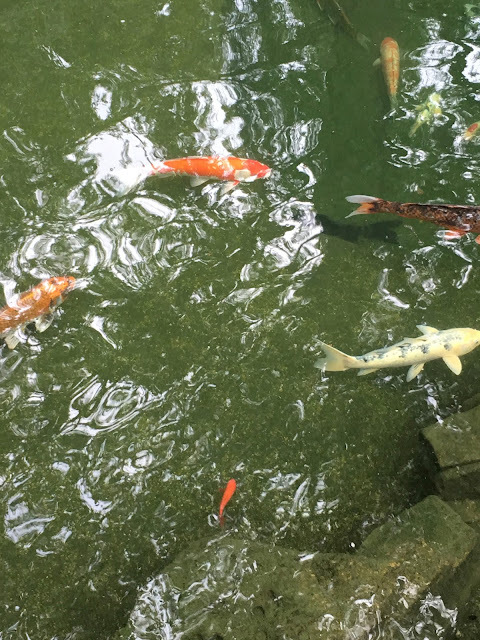 Sometimes when I nearby on other errands in Fort Worth, I just do a drive through the Fort Worth gardens; drive slowly, don't get out of the car, then on my way again after a 10-minute refreshing look at nature. Stacey, I have heard so much about the Arboretum and I would love to go. The Biltmore and Butchart Gardens are spectacular! Such a cute pic of you...Happy Tuesday! Great to catch a glimpse of your Dallas Arboretum, Stacey! We've seen several large gardens including Atlanta, DC, Biltmore, Monticello and Williamsburg, and got to experience a bit in San Diego. Hard to say which impressed me most - probably Monticello, for the historical value in Jefferson's lasting work in both landscape and food gardening, and the views are breathtaking. Glad to see you were obviously enjoying a bit of conversation and cooler temps. You look adorable. You did such a great job of capturing the joy of the Dallas Arboretum. We go there several times a year!! Can you believe I haven't been to the Dallas Arboretum. Every year I say I'm going to check it out but time twinkles by. We did go to Buthcart Gardens for our honeymoon - it was amazing but I think I was to young to really enjoy the detail. I guess for now I'm going to enjoy my garden here on the farm because I have this feeling it won't be mine for very long.. So sorry to see you end such a successful link party...there was times when I was a little late getting to the party and you had 3 pages of linkers.... I understand link parties can be time consuming....thanks for hosting the party...it was a fun ride. The Dallas Arboretum looks like a beautiful place to visit. Such a cute picture of you with Mark Twain! What a beautiful place to walk or sit and just enjoy the beauty. Have a great day, Stacey! I can't believe our family still has not visited Dallas, since living in Texas. I will putting Dallas Arboretum on my list of places to visit someday! That picture of you and Mark Twain is so cute! I continue to be amazed the the Dallas Arboretum every time I visit! We will miss Thoughts of Home, but I completely understand. Dallas is a fun city to visit, but I've never been to the Arboretum before. I enjoy visiting the Birmingham Botanical Gardens. They host wonderful events, even a fantastic antique show in October. Bellingrath Gardens in Mobile are wonderful, too, with probably the best display of azaleas anywhere in the world. Great post! I hope you set Mark Twain straight! I was only in Dallas once, for a conference, but the spot we stayed was blog worthy. We stayed at the Hilton Anatole which might have a different name almost 5 years later. It was wonderful to walk around the grounds to enjoy the beautiful sculptures. I love the Dallas Arboretum and have had visited in the fall, Christmas, and summer! It was amazing each time. You look adorable talking to Mr. Twain. I am sad THOT is ending but I can understand how much time it takes. You were a great success and can be proud of what you accomplished! I cannot believe that I have never been to the gardens except for a wedding at dusk. While it was beautiful, we were in one area that had low lighting. Very romantic, but not exactly great to see the garden. I will definitely put this on my list of places to go! Thanks for sharing! Stacey... Thank you for giving me a trip down memory lane. I used to love to go to Dallas Arboretum during the Fall. I'm going to miss your link up. Y'all did a great job putting it together. Have a wonderful week and I hope your house plans are moving along. Looks like a great place to walk around. I do want to visit Texas someday and I am happy to be able to get glimpses of it through all of the Texas blogger girls. So sorry that Thoughts of Home is ending but it was great for 40 weeks. Oh I do love the Arboretum! Went a couple of times when my daughter was living up there. Here in the Austin area, we have Zilker gardens...I haven't been in ages but it is beautiful too. Stacey, I love the picture of you and ol' Sam! We have the Atlanta Botanical Gardens here in Atlanta and it is stunning anytime of year too. Sad to see "Thoughts of Home" end but glad you are continuing to blog often. Stunning vignettes and I am sorry to see the end of The Thoughts of Home Party!! Our daughter moved from Dallas to Plano and we love visiting, There is so much to do and see and we've had the chance to visit the Arboretum. It's beautiful! Thank you for sharing with us this week at Celebrate Your Story, have a great weekend. 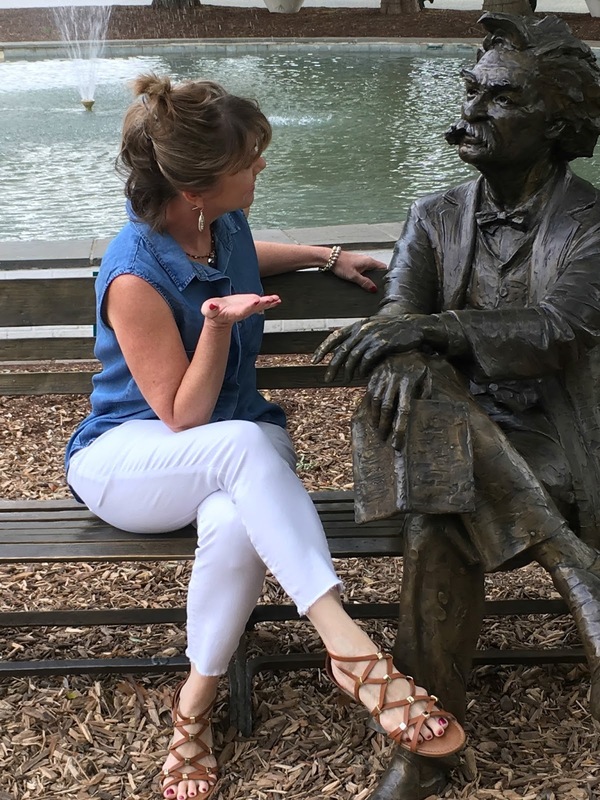 Stacey, you and Mark Twain are so cute together. I'm sure you had a fun conversation. :) I am going to have to visit if I ever make it to Texas. I have been to Butchart and they are beautiful! I love touring gardens in other states. Thanks for sharing with SYC. I haven't visited the Dallas Arboretum yet, but every fall I vow that I will get down south. I love Butchart Gardens, the Denver Botanical Gardens and Bellingrath Gardens near Mobile, Alabama where my Mom grew up. There are just so many wonderful gardens to visit, I really need to get busy visiting more of them! I've never been to Texas but when I visit I know I need to head to Dallas to check out this beautiful garden!